HP announced a refresh of its business notebook and desktop PCs to address the changing needs of small businesses. 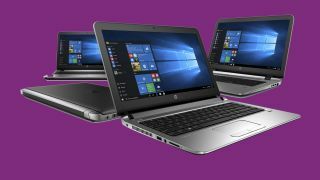 The new notebook and desktop systems come with Intel's sixth generation Skylake processor, and HP is also bringing AMD's sixth generation APU to its ProBook 455 notebook. HP is also refreshing its lineup of business LaserJet printers, delivering faster print speeds and higher page yields in more compact packages. The company says that it is bringing better security and manageability to these systems to meet the needs of a rapidly changing workplace. Citing an internal survey, HP found that its enterprise customers are increasingly working remotely, and that these systems are designed to enable mobility while increasing collaboration. As part of HP's enterprise lineup, the systems have undergone 120,000 hours of testing to ensure durability. HP also bundles some of its software to help small and medium business users manage security, such as HP BIOSphere for BIOS protection, HP Client Security for drive encryption and multi-factor authentication and TouchPoint Manager for cloud-based managementment. To address the needs of mobile business users, the ProBook 400 G3 series are up to 17% thinner and 12% lighter than the previous generation. The ProBook 400 G3 series notebooks are available with up to an Intel Core i7 Skylake processor, 16GB DDR3 RAM and 1TB hard drive or 128GB Solid state drive. There are several different models in the series. The ProBook 400 G3 has a 13.3-inch HD display, the ProBook 440 G3 comes with a 14-inch HD display and the ProBook 450 G3 and 455 G3 come with a 15.6-inch HD display. A touchscreen is an optional extra for these laptops. The main difference between the ProBook 450 G3 and the ProBook 455 G3 is that the 455 model comes with AMD's latest processors, maxing out with an AMD A10 APU. The laptops come with a full-sized spill-resistant keyboard. HP claims the notebooks have "long battery life," but the company did not give specific numbers. For connectivity, the laptops come with two USB 3.0, single USB 2.0, HDMI, headphone and microphone combo jack, a multi-card reader, Ethernet and VGA ports. The larger 15.6-inch ProBook 450 G3 and 455 G3 come with a second USB 2.0 port and options for an integrated optical drive. The ProBook 400 G3 measures 12.83 x 9.2 x 0.88 inches (32.6 x 23.37 x 2.24cm) and weighs 3.31 pounds (1.5kg). The ProBook 440 G3 measures 13.35 x 9.61 x 0.89 inches (33.92 x 24.42 x 2.25cm) and weighs 3.69 pounds (1.68kg). The ProBook 450 G3 and 455 G3 measure 14.88 x 10.42 x 1.04 inches (37.8 x 26.45 x 2.65cm) and weigh 4.74 pounds (2.15kg). The ProBook 400 series will be available this month, starting at $499 (£324, AU$711). With the second generation ProOne, HP said that it has redesigned its all-in-one desktop. The HP ProOne 400 G2 has a variable-angle reclining stand so you can choose the perfect angle to work with your content, similar to Microsoft's Surface Pro 3. Alternatively, you can also use a desktop mounting stand, or you can also attach it to any VESA-compatible mount. To fit your desk better, the ProOne 400 G2 comes in a variety of colors, is equipped with a cable management system and features HP Noise Reduction Software for better compatibility with Cortana on Windows 10. It has an edge-to-edge multi-touch display. The ProOne can be configured with Intel's sixth generation Skylake processor. It will be available in October starting at $679 (£441, AU$968). HP also offers several different desktop form factors in the ProDesk 400 Series. There is a ProDesk 400 G2 Desktop Mini, which is a compact form factor PC, a ProDesk 400 G3 Microtower and a ProDesk 400 G3 SFF. The series will be available starting October, with a starting price of $479 (£311, AU$683). In order to redesign its printers, HP first redesigned its LaserJet toners. These toners melt at a lower temperature to use less energy, deliver higher page yields and increase the print speed for faster printing. As a result, the new LaserJet 400 Series are up to 26% more compact than the models they replace and can print up 150% faster for 2-sided jobs. The base model is the LaserJet Pro M402 ($269, £175, AU$383), which is a monochrome printer that offers two-sided printing. It's 100% faster than the M401 that it replaces and the toner yield is increased by 30%. The LasetJet Pro MFP M426 ($449, £292, AU$640) is a monochrome multi-function printer that's 26% more compact than the M425 that it replaces, offers 100% faster two-sided printing, and increases toner yield by 30%. The LaserJet Pro M452 ($399, £259, AU$569) is a color printer that's 10% smaller and delivers 150% faster two-sided printing than the M451. The LaserJet Pro MFP M477 ($529, £344, AU$754) is a color multi-function printer that replaces the M476. It's 23% smaller than the M475, yet it can print two-sided documents 150% faster. This model features a larger 4.3-inch touchscreen compared to others in the series. All these pro-class printers come with an easy slide-off glass design so you can quickly slide off and remove documents from the scan bed, a slow close lid on multi-function models, faster setup times and an adjustable touchscreen. The USB port on the printer allows you to print Microsoft documents, JPEGs and PDFs straight from a flash drive without having to connect to a PC. The printers support mobile printing on tablets and phones as well as NFC and wireless direct printing. As these printers are designed for small teams with three to ten users, HP is adding job storage security. With this feature, printing doesn't start until you enter a PIN on the printer, ensuring that printed confidential or private documents aren't left out in the open. All printers in the series will be available in October.